Amir Toumaj, an independent Iran analyst based in Washington, D.C., told JNS that Iranian Foreign Minister Javad Zarif’s resignation stunt, where he resigned only for Iranian President Hassan Rouhani to reject the move, was meant to push back against being marginalized. Supreme Leader of Iran Ayatollah Ali Khamenei (left) with President Hassan Rouhani. Credit: Wikimedia Commons. 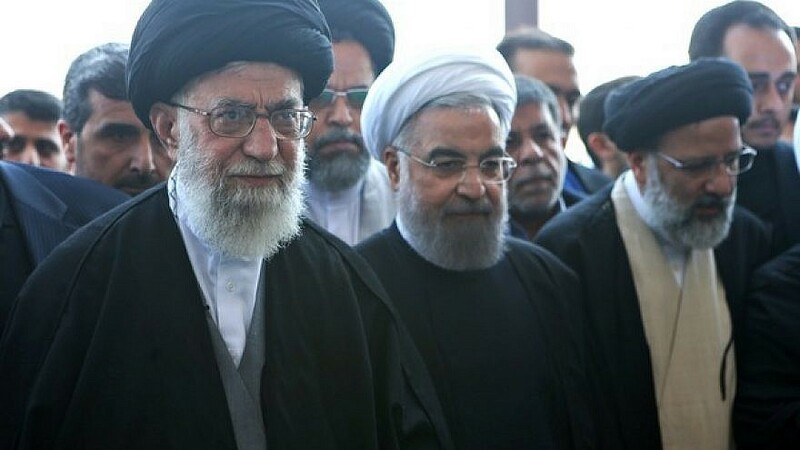 (March 25, 2019 / JNS) The tightening of U.S. sanctions against Iran and the administration’s objective to restrict its oil exports could be causing internal strife among Iran’s leadership and leading the country to seek new economic ties. It was apparent that Rouhani and Zarif had no reason to be at the meeting between Khamenei and Assad since it is obvious to the world that the presidency is practically irrelevant on foreign-policy files like Syria, where Khamenei and Soleimani are the main players, assessed Toumaj. Last year, Khamenei dispatched his foreign-policy adviser, Ali Akbar Velayati, as envoy on an important trip to Russia. Many wondered why Zarif was not sent. Furthermore, continued Toumaj, “Zarif was embarrassed after the Europeans arrested an intelligence operative using his cover as a diplomat in a bombing plot in Paris. And there were other plots that were foiled, all of this while Zarif was trying to foster good ties with Europe over salvaging the Iran nuclear deal,” known as the Joint Comprehensive Plan of Action, or JCPOA. Europeans say the Paris plotter acted on orders from a senior official in the intelligence ministry. “Previous assassinations on European soil were approved by top officials, including Khamenei. It is highly unlikely that the latest attempts were rogue,” said Toumaj. Toumaj and others have speculated that opposition to FATF has also factored into Zarif’s decision. Zarif has had little progress with the FATF, which the U.S. administration says is crucial for Iran to be connected to the global financial system. “Khamenei and the IRGC have voiced opposition and are skeptical of Zarif’s approach to end Iran’s financial chokehold by the FATF. “It is very hard to imagine that FATF would accept Tehran’s exemption for designated terrorist groups such as Hamas and Hezbollah,” said Toumaj. When it comes to the Iran nuclear deal and Europe, Zarif is attempting to persuade Europe to break with the United States on sanctions and continue economic relations. However, Zarif “knows that Europe is unlikely able to deliver on Tehran’s demand to expand trade in areas where the U.S. has imposed sanctions,” argued Toumaj. Rouhani, by rejecting the resignation letter, showed that he needs Zarif. Therefore, as economic pressure continues to be amped up and Tehran suffers greater fiscal hardship as a result, it can be expected the domestic unrest will increase, and as a result, Rouhani’s administration would be made the scape goat.